(Newser) – Prescription painkillers should not be a first-choice for treating common ailments like back pain and arthritis, according to new federal guidelines designed to reshape how doctors prescribe drugs like OxyContin and Vicodin. Amid an epidemic of addiction and abuse tied to these powerful opioids drugs, the Centers for Disease Control and Prevention is urging primary care doctors to try physical therapy, exercise, and over-the-counter pain medications before turning to painkillers for chronic pain. 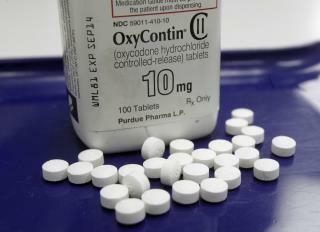 Opioid drugs include medications like morphine and oxycodone as well as illegal narcotics like heroin. Under the new guidelines, doctors would prescribe painkillers only after considering non-addictive pain relievers, behavioral changes, and other options. The CDC also wants doctors to prescribe the lowest effective dose possible. And doctors should only continue prescribing the drugs if patients show significant improvement. As many others have already stated here, I'll join in with the "I, too, suffer from chronic, life-altering back pain." I could call my doctor's office as soon as it opens and get a prescription for oxy. Can't take opiates or opioids as I'm severely allergic. Actually, I consider myself to be fortunate in this regard as I'd have to take so many that I'd be completely unable to function at any time. I'm also fortunate to live in one of the 'Green' states where medical cannabis is legal. It helps deal, it does not take the pain away. I guess I'll just have to do heroin. ThanxObama! Better headline: CDC to Doctors - Take a chill pill on those chill pills.